Hopeful strives for women to be treasured and valued, and that through this event they will discover all the hope that God has for them to embrace in their lives. Our guest speaker is Jean Skipper from Kings, Norwich. If you are from Wymondham, Attleborough, Thetford, Dereham or anywhere in the surrounding area, come along for a wonderful evening of fellowship with other women, and a time of experiencing our God to the fullest. 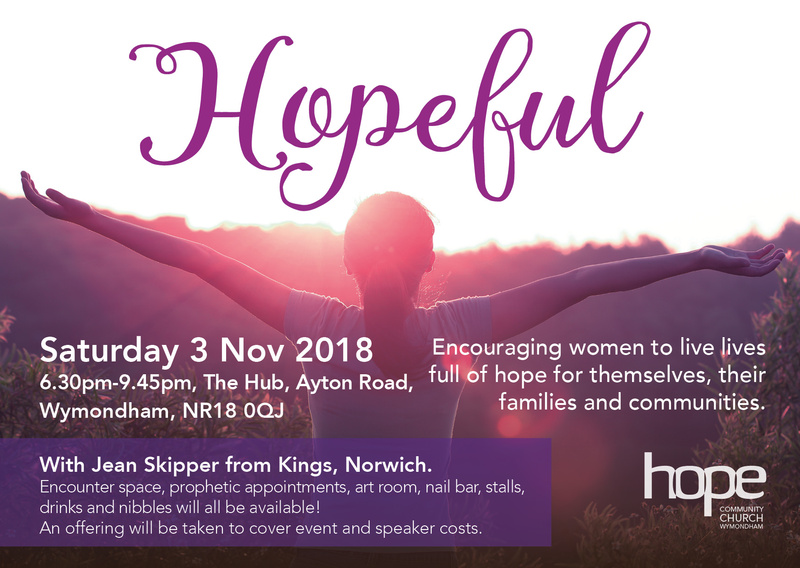 Hopeful will be held at The Hub, Ayton Road, Wymondham, NR18 0QJ, from 6.30pm-9.45pm on Saturday 3 November. Please do invite friends, family, neighbours and women in your church to this wonderful event! !